POMPEY have been urged to keep Paul Hardyman at Fratton Park. The Blues first-team coach should be remain at the club in the wake of Paul Cook’s appointment. Paul has played under and coached with some of the best managers in the game. That’s the view of former Fratton Park defender Kevin Ball. First-team coach Hardyman and current assistant manager Gary Waddock find their positions under scrutiny, as the new manager weighs up his backroom team. Chief executive Mark Catlin has stated talks are taking place to bring in Cook’s assistant at Chesterfield, Leam Richardson. Catlin also aired the suggestion of other staff moving south from the Proact Stadium. 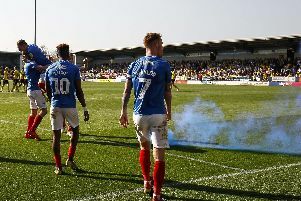 Hardyman has an association with Pompey spanning 25 years as a player and host of coaching roles. Ball, who has played with both Cook and Hardyman, believes there needs to be a continuing role for the 51-year-old. He said: ‘If Paul goes it will be very harsh. ‘I’d like to think there will be a place for him moving forward. ‘Paul has played under and coached with some of the best managers in the game. ‘Whether he stays or not will be up to Cookie. ‘But I’d like to think he’d be able to stay with the first team, or they find a significant role for Paul. ‘You’d think someone who’s shown his loyalty to the club will be looked after. ‘He has great experience and knowledge of the game – and of Portsmouth. Ball has already given a ringing endorsement to Cook’s credentials as he arrived at Pompey this week. He defended the appointment of previous managers Guy Whittingham and Andy Awford by the club’s board. Ball said: ‘You hope the club works it way up the leagues, and I feel Paul is a good man to take them forward. ‘I felt sorry for Andy Awford, who is synonymous with Portsmouth Football Club. ‘I was disappointed for him to leave the position. I’d like to have seen him be successful, but it wasn’t the case. ‘Different situations call for different people at the time, though. ‘When Guy and Awfs took over they were the right people at the time.